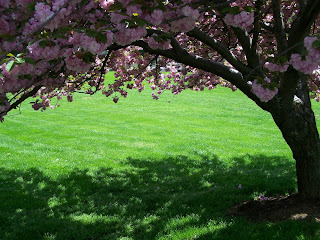 I have reiterated more than once how I love spring especially here in Maryland. Although I love the weather and beaches of Hawaii, nothing beats the colors that sprout in Maryland especially during this time of the year. 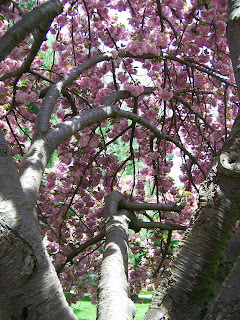 The flowering trees here are just astounding, and they leave me breathless every time I see a tree in full bloom. 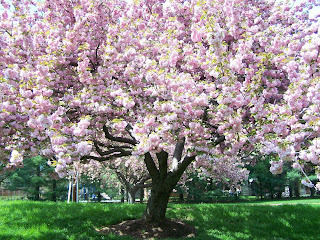 After the celebrated cherry blossoms shed their petals, other trees steal the limelight. Who doesn't remember Joyce Kilmer's poem, Trees? I remember reciting this in grade school, and I thought it was appropriate to accompany these photos. These were all taken last weekend. Mind you, but I sat and relaxed underneath that tree for hours. kainggit! the only place here in QC with that kind of ambiance is my university's campus. when i was still in college, i spend hours just sitting in the area; reading a book or listening to my walkman*. eks, this time of year, i love reading or just sitting underneath trees. you made me laugh about your walkman comment =). i still see some people use that around here...lol. I'm so inggit! I don't know when will I ever experience spring. Of course, not in this part of the world. Lol. Enjoy your weekend! wits, i think you're already enjoying your weekend. i still have a weekly report to deal with...sigh. hi kayni! you really got nice pictures here. 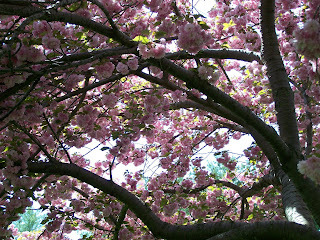 when the trees were in bloom here, i would just look up at the wonder and tell myself to bring my camera--i tell that everyday until all the leaves fell off... now i only have those beautiful memories of my first spring experience in my mind and heart. my friends anne and thessa went to seoul's spring festival and watching your pictures here made me realize i haven't posted pictures on my site yet..
jehan, i'm camera crazy. i always bring my camera with me, but also, those trees are located in my apartment compound, so they're accessible. It's really pretty out there. I have seen photos of spring in the East, I'm a bit envious. Photo Cache, Thank you for the visit. The pics are beautiful! I love your trees, very spring-y! dyosa, me too. i'd like to go to japan and see the blossoms there. angeli, happy weekend. i miss the old Baguio. sheng, thank you. i'll miss all these flowers when summer comes. rico, indeed a perfect place to rest. i love colors too, but if i were to have a choice, i'd pick hawaii over maryland. nothing beats having wonderful weather throughout the year. ah, would love to spend a week or two in hawaii right now. sagada, i have to admit. hawaii will always be number one in my heart. enjoy your weekend. beautiful :D i know this poem too, i think i learned it when i was in 3rd grade. wow! what lovely blossoms! ang ganda ng colors! grabe! nature at tis best ano? What's that tree? It's as beautiful as the cherry blossoms, I believe. To be honest, I would have dreamed of having a park somewhere in the vicinity where trees as beautiful as that are abundant. I really love to experience reading a book and simply just have a me time at the park. toni, this is one poem i always remember. kg, yes, spring is in full blast here. lene, i'm not really sure about the name of the tree - it could be in the apple family "daw". cpsanti, it's a popular poem - i still remember it to this day.